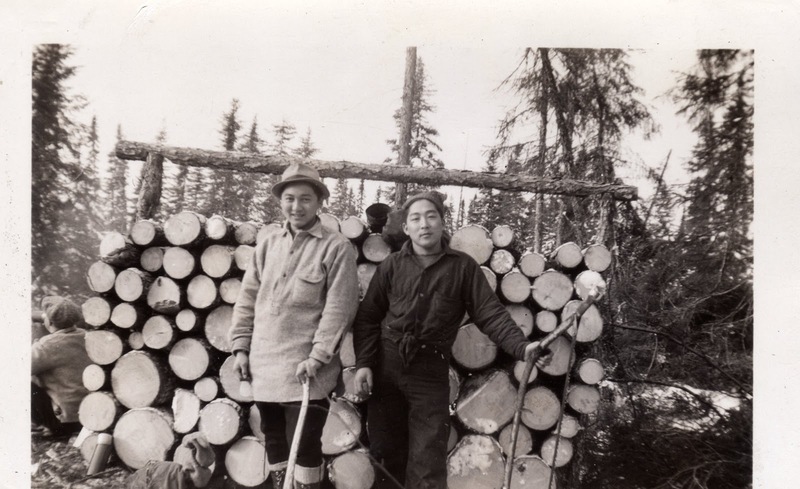 Yoshio (Yon) Shimizu (left) was forced to work at a bush camp after the Canadian government ordered him to leave the British Columbia coast in 1942. Shimizu, who went to become a business executive in Wallaceburg, Ont., did not get to graduate with his Victoria High School classmates. Yoshio (Yon) Shimizu, 87, has enjoyed a long marriage, raised a fine daughter, finds satisfaction in retirement from a successful career in the faucet industry. His health is good, though he has lost his eyesight and his memory is not as cracker-jack sharp as before. The resident of Wallaceburg, Ont., is at a stage of life when one wishes to complete unfinished business. Mr. Shimizu belongs to the Class of ’42 from Victoria High School in the city in which he was born. The yearbook includes a photograph in which he wears a dark suit and tie, his face stern and his jet black hair swept back from his forehead. He is hailed as “one of the brightest and most cheerful boys” in the class. Yet, he did not get to graduate with his peers. A top student, a basketball star and an all-round popular figure at school was ordered to leave the city. A school year that had begun with such optimism about future prospects ended abruptly. In a few terrible weeks, Mr. Shimizu’s plans and those of his fellow Japanese-Canadian classmates were forever altered. Japan attacked Pearl Harbor and then Hong Kong 70 years ago this month. Then, in February, just three days after Mr. Shimizu’s 18th birthday, the Canadian government imposed a sunset-to-sunrise curfew on all people of Japanese ancestry. They were to be forcibly removed from the West Coast. “It was a shock what the government proposed to do with us,” Mr. Shimizu said. His siblings and widowed mother were ordered to Vancouver, and from there, on to the internment camp at New Denver in the British Columbia Interior. Mr. Shimizu, determined to graduate with his his classmates, asked the school principal to help him extend his stay. Since the family’s home and the stock from their dry-goods business were seized, he got a neighbouring family to agree to take him in. But the youth’s appeal was denied and he was ordered to report. The attendance book in the school archives indicates his last half-day of studies occurred on April 23, 1942. An assembly bade farewell to the school’s few Japanese-Canadian students, including among them Yasuo Hasegawa, known as Pete, an army cadet. The principal, Henry L. Smith, read a psalm. The students recited the Lord’s Prayer before filing quietly from the auditorium, some of them crying, passing through a door held open by young Mr. Shimizu. The young man packed his possessions in an old army duffle bag, carefully folding the prized No. 8 singlet he wore as a forward on his basketball team. He had not experienced much racism himself, but he worked as a newsboy selling the Victoria Daily Times on a downtown corner. He read the headlines. “It was all the propaganda in the newspapers and the politicians yelling for us to be shipped out of Canada that would make you realize there were people who weren’t happy to have Japanese in the province,” he said. For one brief week, he had been taken in by the Burnett family, British immigrants who lived around the corner from the Shimizu home. The father was a sawmill labourer, while the mother worked as a housekeeper. Their son, John, who also sold the Times, inherited the Shimizu route, as well as his prized corner of Yates and Government. The family’s kindness was not well received by others. “We got called Jap lovers and all that crap,” said John Burnett, 84, who now lives in Nanaimo. Young Shimizu was ordered to Hastings Park in Vancouver where, as a young, single man, he was ordered to a work camp outside Schreiber, Ont., where he swept floors and kept the fires stoked inside a tar-paper shack serving as a kitchen. He was then transferred to a sugar-beet farm near Glencoe before being sent to a bush camp at Kapuskasing in November, 1942. In 1943, he got permission to join a brother in Toronto, eventually completing his high school education at Jarvis Collegiate. A skinny physique made the tree falling and sawing at the bush camp exhausting, while a job found for him at a plating company in Toronto was also too physically taxing. After the war, he returned to the classroom, studying chemical engineering and eventually gaining a degree in business administration. He retired in 1985 as a high-ranking manager with Waltec Industries (now Delta Faucets, formerly Wallaceburg Brass). Years passed before he would allow himself to return to Vancouver Island. When he first did so, he visited the Burnett family to offer his thanks. He also renewed acquaintances with Mary Hamilton, his old French teacher at Vic High, who had been the only member of the student body or faculty to write him after he was forced from Victoria. As well, the Class of ’12 is considering a suitable commemoration for those members of the Class of ’42 who were denied the triumph of a graduation ceremony — and so much more — seven decades ago. Yon Shimizu was a star basketball forward in his hometown of Victoria. 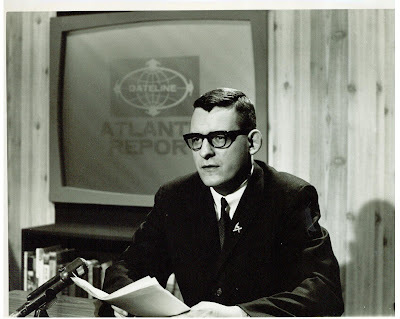 Bill Ozard became one of Nova Scotia's best-known radio and television broadcasters. He later unwittingly ran afoul of British Columbia's Social Credit government. Bill Ozard began working for the B.C. tourism ministry on a February morning in 1978. Less than two hours later, he was fired. The sacking generated newspaper headlines, tough questions in the Legislature, and, eventually, an out-of-court settlement. The incident was an inconvenience for Ozard and an embarrassment to the province’s Social Credit government. The dispute was all the more remarkable for having been caused by a classified advertisement placed by Ozard expressing his gratitude for the job. Ozard, who has died, aged 73, had a long career as a broadcaster in Victoria and Halifax, where he was a familiar figure as a hotline host, election-night commentator, and contributor to the annual Christmas Daddies Telethon. William Wakefield Ozard was born in Victoria on Feb. 2, 1938, to Evelyn Royal Georgina Bonavia and William Charles Ozard, a school teacher. Ozard’s introduction to radio came as a student at Victoria College, where he studied English and history. A radio club formed on campus in 1955 and Ozard was a founding member as one of the “top college disc jockeys” who hit the airwaves each school day at noon. The studio was in a gardener’s hut where they spun records and read the news to students in the nearby cafeteria. The broadcast day for CJVC that debut year ended promptly at 1:25 p.m., so students could return to class. 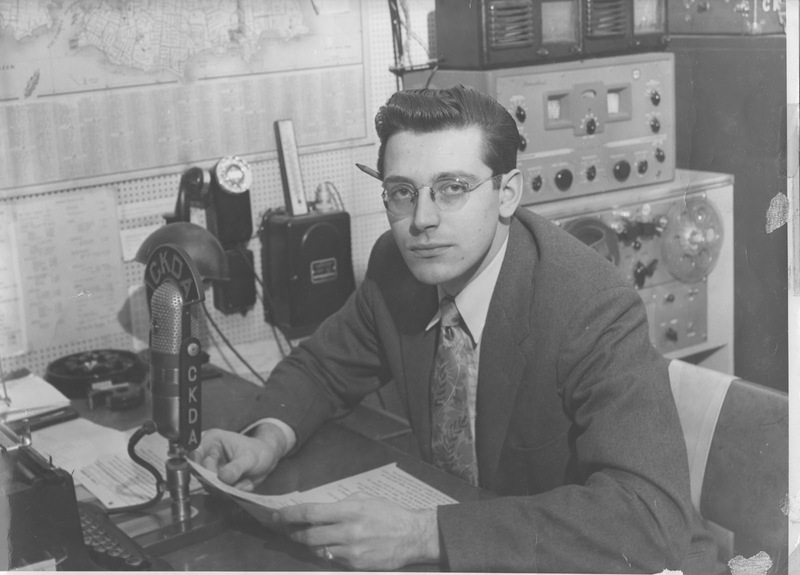 Ozard found work at radio stations CJVI and CKDA in his hometown before leaving to take a post in Halifax with CJCH in 1960. He soon became one of the best-known broadcasters in Nova Scotia, hosting a hotline radio program and anchoring election night coverage on the sister television station launched the year after he moved east. For four years, he hosted Phone Forum, a popular radio call-in show. A photograph from this era shows him in the studio, a headset covering his ears, dark-framed glasses on his face, a cigarette smoking in his raised left hand. A successful hotline show needs “a true dialogue, richly laced with controversy and opinion,” Ozard wrote. “The hosts must take stands on issues, they must be crusaders.” One of his show’s successful campaigns led to an inquiry into conditions at a mental hospital at Cole Harbour. He left radio briefly in 1969 to become a publicist for the Scotia Square development in downtown Halifax, only to soon after return to CJCH as station manager. In his 1999 book, Not Guilty: The Trial of Gerald Regan, the journalist Stephen Kimber tells a story about how an exposé on vote buying in Regan’s constituency got killed. The radio station’s owners were seeking to purchase a television station and feared upsetting a powerful Nova Scotia Liberal. It fell to Ozard to break the news to reporters and it was a sign of his management style that he allowed them to angrily express their dissatisfaction. In the 1974 federal election, Ozard challenged longtime Progressive Conservative incumbent Bob McCleave in Halifax-East Hants. The broadcaster increased the Liberal share of the vote, but he still finished a distant second. The defeated candidate took a position as director of special promotions in the Nova Scotia tourism ministry, later becoming deputy minister. It was with those qualifications that he was hired by the British Columbia government as a $2,035-per-month supervisor of travel marketing. He rented an apartment in Victoria and placed a classified advertisement in the local newspaper expressing his gratitude. He thanked 13 people by name, including tourism minister Grace McCarthy and her deputy. When he reported to work he was told his tiny advertisement created the impression his had been a patronage hire. “I never dreamed there could possibly be any adverse comment on a thank-you note,” he said. Ozard was dismissed after about 90 minutes. Reporters were told he had not passed his probationary period, the same excuse offered in the Legislature when the matter was raised by the opposition New Democrats. Ozard filed a writ of summons in the B.C. Supreme Court to determine whether he remained in the ministry’s employ and, if so, to order his salary be paid. The matter was settled out of court with McCarthy telling the Legislature the bureaucrat had received $4,300. He wound up with a similar job in neighbouring Alberta where for several years he promoted travel within that province. Ozard was diagnosed with colorectal cancer five years ago. He died from the disease, or, as his family stated in a paid obituary notice, “signed off the air,” on Nov. 25 at Bedford, N.S. He leaves a son, four daughters, three grandsons, and a sister. Bill Ozard checks an avalanche of mail at CJCH in Halifax, circa 1961. In June, the Big Bad Wolf knocked at the door of Tall Tale Books, a children’s store. The owners, Kate and Drew Lorimer, were prepared to shutter the store, giving up on a dream of creating a bright, kid-friendly bookstore of their own in downtown Victoria. They decided to take one last shot, hitting on the idea of what they called the Hero Society. They asked patrons to subscribe for as little as $10 per month in exchange for merchandise at the store. That way the couple could have a predictable, guaranteed income and keep the store afloat. Kate, Drew and Emma Grace Lorimer. In a month-long campaign, they sought 400 subscribers by Canada Day. ”Six months later, we’re still here,” Mr. Lorimer said. The store’s third Christmas season has been its busiest yet. Particularly popular have been Patrick McDonnell’s Me ... Jane (“a picture book about Jane Goodall as a kid — adorable, simple sweet story but inspirational”) and Sherri Duskey Rinker’s Goodnight, Goodnight, Construction Site (“a humourous bedtime lullaby book about construction vehicles on a worksite going to bed with teddy bears and blankies”). In the end, another year passed with the Lorimers having kept the wolf at bay. Can’t yet call it a happy ending, as the story of Tall Tale Books is still being written. Of the more than 50 “Eyes on the Island” columns published this year, none got as much attention as a report on Daniel Loxton’s efforts to get published an illustrated children’s book on evolution. The Victoria writer and illustrator shopped his book to American publishers, none of which would agree to bring the book to market. Instead, the evolution book was released by Canadian-owned Kids Can Press of Toronto. The news that American publishers wouldn’t touch a children’s book about evolution generated about 600 Tweets, including one by the film and culture critic Roger Ebert, as well as more than 4,000 Facebook recommendations. It was mentioned on CNN. Soon after, Loxton launched his second book, Ankylosaur Attack, at Tall Tale Books. A herd of dinosaur-loving children, many of them exhibiting their fierce claws and fangs, listened to the author Grr! Arr! and Rawr! his way through a reading. Social media also played a prominent role in the municipal campaign of Lisa Helps, who was one of three rookies elected to Victoria city council in November. Ms. Helps’ savvy operation included regular Facebook and Twitter updates. She called on other candidates to join her in a hootenanny at Logan’s Pub and she held weekly work crews to repair fences and tidy community gardens. The candidate whose name doubles as a campaign slogan finished in third place in the at-large election, within striking distance of topping the polls. After her victory, she converted her campaign website into one in which she asks the public for input on issues facing council. Her slogan: “A city where citizens lead.” It will be interesting in the new year to see if the citizens feel any more empowered with this council than its predecessors. Last January, we looked at the shuttering of the Blethering Place, a restaurant on Oak Bay’s High Street decorated as though by one’s eccentric English auntie. For three decades, the restaurant served as Victoria’s “favourite faux Tudor tearoom,” as it was called, offering bangers and mash to a clientele that included Graham Kerr, the Galloping Gourmet. Today, the Oak Bay Bistro offers bison, chicken liver parfait, and local artisan goat cheese from Saltspring Island. Fish and chips? Not on the menu. But there is slow-roasted Arctic char with roasted sunchoke and sweet potato hash. Oak Bay has lost some of its Olde England flavour. All for the better. Bonnie and Don Bradley are the husband-wife team behind the new Moon Under Water brewpub in Victoria's industrial Rock Bay neighbourhood. 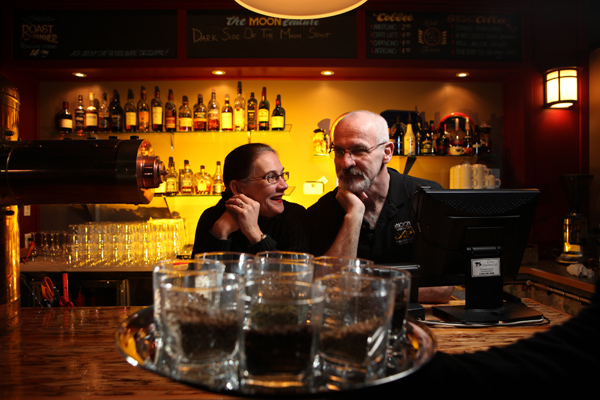 Craft brewers and brewpubs have turned southern Vancouver Island into a beer-lover's mecca. Chad Hipolito photograph for the Globe and Mail. At long last, a diet I can follow. Let’s go to the source. Drive along busy Bay Street to the Rock Bay industrial corridor. Stop at a commercial strip mall. Across the street is a gravel yard. In a nondescript cinderblock building, a former Direct Buy showroom has been transformed into a pub. This is The Moon Under Water pub and brewery, which boasts “the best service in town — because you serve yourself.” Patrons order from the bar, where publicans pour from taps. The glass is held at a proper angle, the amber liquid flowing like the nectar of the gods that it is. A head forms before settling into place as the glass is righted. Bring it to the lips, the beer rolling past the tongue, leaving behind a light caramel flavor. Smooth with a dry finish. Who’m I kidding? It’s a beer and it’s good. Time for another swig. This is a glass of Full Moon Bitter, a flavourful beer brewed from two-row barley, Northwest hops and speciality malts. It won a first-place prize ahead of 17 other British Columbia craft beers at a beer-cask festival held earlier this year by CAMRA, the Campaign for Real Ale. The year-old Moon Under Water is the latest addition to the thriving craft brewing and brewpub scene on southern Vancouver Island. Thirty years ago, a pub owner challenged Prohibition-era laws to open a brewpub in West Vancouver. Two years later, in 1984, Spinnakers opened as a neighbourhood pub in a forgotten, mixed industrial and residential corner of Vic West overlooking the harbour. A month later, the pub served the first batch of its beers — an ale, a malt, a stout, and a special brew. And people came and they drank and, lo, they pronounced it good, so others went forth to begat other craft breweries. Today, Victoria boasts four brewpubs with others in Sidney, Duncan and Nanaimo, while another quartet of Victoria brewers offer even more choices for the discerning quaffer of fermented malt beverages. The larger brewers — referred to as “factory beers” by Mr. Bradley and as “the Big Guys" by Mr. Dodds — want in on the market. Many specialty brews are released in the harvest and yuletide seasons. They are known for unique taste combinations, as well as for lively monikers and memorable labels. Vancouver Island Brewery has released a Dough Head Gingerbread Ale in which brewer Chris Graham used clove, ginger and cinnamon to create a beer that tastes and smells like the baked treat. It is on tap at the trendy Aura restaurant at the Laurel Point Inn, two bits from every pint being donated to the local Habitat for Humanity to support house-building for low-income families. 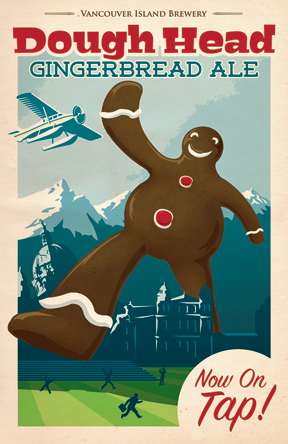 The memorable label features a giant grinning gingerbread man striding over the Legislature. Driftwood Brewery has issued a spicy and complex Belgian-style ale named Farmhand. It is made of partial sour-mash with ground black pepper. Matt Phillips originally financed his dream of an artisanal brewery a decade ago through unorthodox means. Every bank and credit union turned him down for a business loan, but on his way out the door at each he took a credit-card application. Those funds gave him enough to buy brewing equipment and to sign a lease for a dark warehouse above a metal shop. Phillips also has a 24-Mile Blueberry Pail Ale in which every ingredient is said to have travelled no more than that distance from farm to brew kettle. The hops come from Vic Davies, the barley from Mike Doehnel and the water from the Sooke reservoir. When you know the names of the farmers who grew the grains and of the brewer who cooked the batch, then you know to whose health to drink. What it is: A challenge to Prohibition-era drinking laws 30 years ago led to the opening of the first modern-era brew pub in Canada at West Vancouver’s Horseshoe Bay. Two years later, in 1984, Spinnakers opened in Victoria. That same year, Vancouver Island Brewery released its first batch of beers, eventually to be joined by a half-dozen other craft brewers. Today, several fine brewpubs compete for thirsty patrons, offering a selection of ales and lagers brewed on southern Vancouver Island. One of the most popular remains Spinnakers. An aficionado can go on a pub crawl that would seem to last from beer to eternity. How it works: Using natural, locally-sourced ingredients, as well as some of the best water on the planet, craft brewers perform alchemy in copper fermentation vats. The microbrewing industry is a throwback to the early days of the 20th century, when every city boasted competing breweries. Advances in refrigeration techniques and the building of superhighways led to a consolidation in the brewing industry until only a handful of big players dominated the market. In recent years, the demand for premium, flavourful beers has allowed microbrewers to carve a niche of about 10-12 per cent of the B.C. market. The craft brewers “advance people’s tastes and open new horizons in beer experience,” said Don Bradley, proprietor of Moon Under Water pub and brewery in Victoria. His left leg encased in a plaster cast, Fred Etcher had to skip the biggest hockey game of his life. He stood on crutches as he prepared to address his teammates in a dressing room near an outdoor rink at Oslo, Norway. A broken bone in his ankle had failed to heal in time for the 1958 world championships. The tournament’s final game pitted the Soviet Union versus Canada’s representatives, a squad of amateurs from small-town Ontario. The Whitby Dunlops carried the name of a sponsor, a tire manufacturer, on their sweaters. They claimed the senior amateur championship in Canada months earlier, earning the right to represent the country at the upcoming world championships. As the players prepared for a one-game showdown against the Soviets, telegrams urging them on to victory sent by fans back home were read aloud. Then, Mr. Etcher stepped up to wish his teammates good luck. In the midst of his exhortation, he broke down. Even an athlete who could not play succumbed to the great pressures of representing Canada against a foe seen as the embodiment of evil. The Dunlops “were carrying the worries of the world on their shoulders and they played as if the world had a bulldozer on top of it,” the sportswriter Milt Dunnell told readers of the Toronto Star. Etcher, who has died, aged 79, traveled overseas with the team, his cast painted in the Dunlops’ distinctive black-and-yellow livery. (Earlier, when a Soviet team embarked on a goodwill tour of Canada, the forward Veniamin Alexandrov signed the cast as a gesture of friendship.) Though he could not play, Etcher became a familiar figure at the outdoor rink as he outshouted all fans in cheering on his teammates. The town of Whitby paused as the final game of the world championship was played. Even though her husband was not skating, his wife listened attentively at home in Whitby, radios tuned to Foster Hewitt’s play-by-play call of the world championship game. She turned on a set in both her bedroom and parlour, so she would not miss any action as she nervously paced between the two rooms. The Dunnies prevailed at Jordal Amfi Stadium, coming from behind to defeat the Soviets 4-2, setting off wild scenes back home, including an impromptu parade of cars and the burning of an effigy of a Soviet hockey player. Etcher, a 180-pound left-winger, had a reputation as a smooth skater with a lethal shot. He had heavy-lidded eyes, a hint of a widow’s peak, and combed the brow of his short-cropped hair straight back in the fashion of Bing Crosby. A member of the Dunlops’ top line, along with Bob Attersley (obituary, April 7, 2010) and George Samolenko, he also handled penalty-killing duties, his superior skating allowing him to rag the puck. A devout Mormon, who remained active in his church throughout his life, Etcher opposed playing hockey on the sabbath. Frederick Keith Etcher was born on Aug. 23, 1932, the first of six children — three boys and three girls — to Nellie and Keith Etcher. 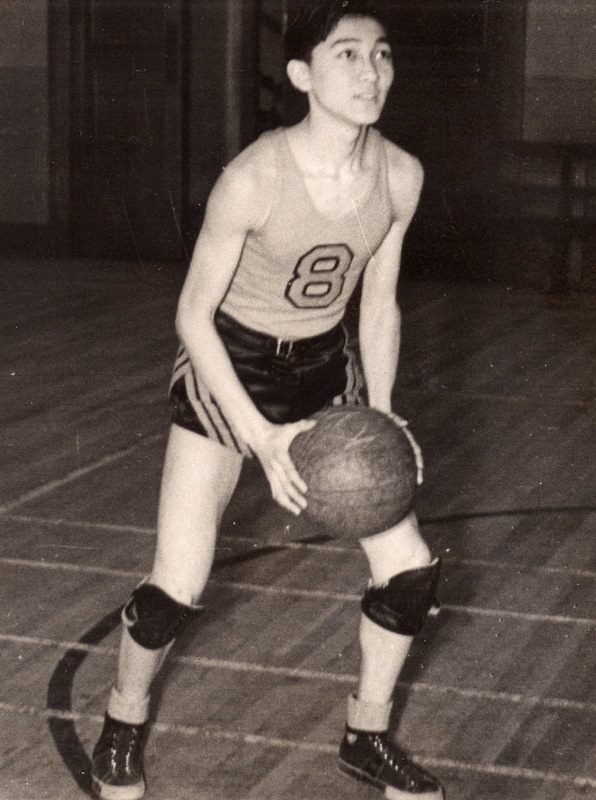 He was still a teenager when he led the Oshawa Bees to the junior-B championship and a league scoring title in 1951. 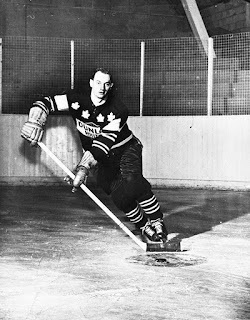 He moved up a rank to the Oshawa Generals for two seasons before his scoring prowess helped the Oshawa Truckmen claim the senior-B title in 1954. 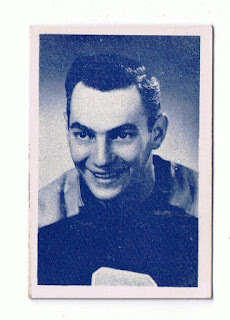 A rare Fred Etcher hockey card. He then joined the Dunlops for whom he would skate for six seasons, winning two Allan Cup amateur titles, a world championship, and an Olympic silver medal. In 1960, the Kitchener-Waterloo (Ont.) Dutchmen were asked to represent Canada in the hockey tournament to be held during the Winter Olympics at Squaw Valley, Calif. The Dutchmen were hoping to make up for the ignominy of failing to win the gold medal in 1956, only the second time the Canadian squad had not been triumphant. The Dutchies supplemented their roster with Whitby players such as defenceman Harry Sinden and the Attersley-Etcher-Samolenko line. Etcher had two goals and an assist in Canada’s opening game against Sweden, a 5-2 victory, then added a hat-trick and four assists in a 19-1 shellacking of hapless Japan. Against West Germany, Etcher opened the scoring with two quick goals, later adding three assists, as Canada cruised to a 12-0 victory. He recorded a lone assist when Canada shut out Czechoslovakia, 4-0. The Canadians’ first serious challenge came against the Americans. Just 10 seconds into the game, Etcher had a clear shot at Jack McCartan in the American goal, but failed to score. The underdogs jumped to a 2-0 lead before the Canadians scored with less than seven minutes left. McCartan turned away all attacks, then, with 20 seconds left on the clock, Attersley raced into the American end with Etcher alongside and but one defenceman between them. Attersley’s pass was knocked away by the desperate defender. Seconds later, as the game ended, the Americans piled on top of their goalie in a delirious pyramid of happiness. The next morning, the Globe and Mail’s front page featured a photograph of the winning goal being scored with Etcher an unhappy witness to the scene. The top line, including Etcher, put on a “shoddy performance,” according to the Star. The Canadians went on to again defeat the Swedes, as well as the Soviets, to gain the silver medal, a prize of little consolation in a land that expected nothing less than gold. Etcher led all scorers in the Olympic tournament with 21 points in seven games, a record that has now stood for more than a half-century. In the fall of 1960, Etcher signed as a playing coach for the Uxbridge (Ont.) Black Hawks, an intermediate amateur team who he helped win several consecutive titles. In summer, Etcher played fastpitch softball, most notably as a slugging first baseman with a high batting average for the Oshawa Tony’s of the Toronto Beaches League. Etcher spent his working life with General Motors, where he retired as an industrial engineer. Etcher has been inducted into both the Oshawa and Whitby sports halls of fame. He died on Nov. 25 at University Hospital at London, Ont. He is survived by his wife, Mary Jane; four adult children; seven grandchildren; a brother; and, a sister. He was predeceased by a brother and two sisters. On Dec. 23, 1979, the Boston Bruins waded into the stands to do battle with rowdy fans at Madison Square Garden in Manhattan. The brouhaha ensued at the end of an NHL game officiated by Gregg Madill. A hockey referee is judge and jury, witness and prosecutor. A verdict is delivered on the spot, the penalty pronounced forthwith. Such frontier justice does not make popular those who don the black-and-white sweater. (In the sporting world, the jurists, not the convicted, wear stripes.) Their uniform leads to the jocular appellation of referees as zebras. More often, they are thought of as asses. Gregg Madill, who has died, aged 67, generated an inordinate amount of criticism even for his profession. Players questioned his calls. Coaches questioned his motives. “The refereeing, as usual, was a joke,” Ken (The Rat) Linseman of the Edmonton Oilers said after one 1983 game officiated by Madill. The ref assessed 164 minutes in penalties, most of those coming after a bench-clearing brawl. Even in victory, players found reason to whine. Montreal’s Steve Shutt was once so incensed by the referee that he deliberately bumped into him with an elbow, earning a three-game suspension from the league office. Perhaps the most devastating assessment came from Sports Illustrated. The American magazine evaluated all 12 NHL referees, ranking Madill at the bottom of the class. A year later, he was dismissed by the NHL, though he did not give up refereeing, soon after patrolling junior games for the Ontario Hockey League. Madill’s career coincided with an era of goon hockey, during which brawls, melees and donnybrooks were as common as an everyday slash. He once ejected nine players from a game for fighting. The most notorious incident in Madill’s career came at the end of a game at Madison Square Garden in Manhattan on Dec. 23, 1979. After the final whistle, players from both teams milled on the ice in a scrum that grew more heated as players argued. A fan then reached over the glass surrounding the rink to sock Boston’s Stan Jonathan in the nose, drawing blood. The Bruins, skates still on their feet, climbed the glass to fight with the fans.Mike Milbury wrestled one fan over a row of seats, ripping a shoe off his feet before beating him with it. 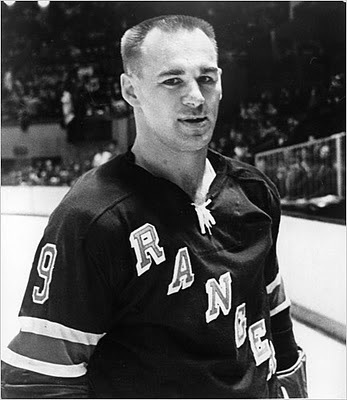 As police broke up the battle in the stands, Rangers captain Dave Maloney had a heated argument on the ice with Madill before smashing his stick on the ice. The ref assessed him a game misconduct even though the match had long since ended. Later, Maloney complained to reporters that Madill had sworn at him and accused New York’s Swedish players of deliberately falling down so as to incur penalties on their opponents, an unsportsmanlike behaviour known as diving. League president John Ziegler suspended three and fined 18 of the Bruins. He took no action against the Rangers, or the referee, though Sports Illustrated blamed Madill for ignoring a trip and a retaliation that led to the scrum after the final whistle. (The brawl remains a staple of sports highlight programs, somewhat to the embarrassment of Milbury, whose current appeal to machismo as a hockey broadcaster is diminished by his ridiculous use of a shoe as a weapon. 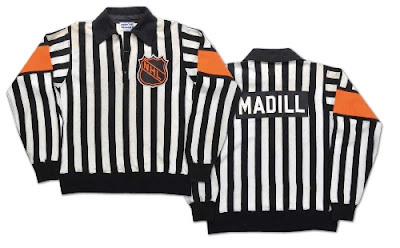 One of the odder incidents in Madill’s career occurred during a game in Denver, when he banished goal judge Rod Lippman after the off-ice official lit the red lamp signaling a goal even though the puck had hit a goal post. It was the goal judge’s third disputed call of the night. Though criticized as an NHL referee, Madill had worked his way up to the league after stints in minor professional circuits. He earned praise for his handling of international hockey games, including a successful assignment as an official at the world championships in Moscow in 1979. Richard Gregg Madill was born in Toronto on July 15, 1944. He died on Dec. 5 at his winter home at Kissimmee, Fla. He also had a residence in the village of Apsley within the township of North Kawartha, Ont. He has been a residential building contractor. He leaves his wife, Judy; two sons; a stepdaughter; and, six grandchildren. One of his sons, Jeff Madill, a right-winger, played 14 games with the New Jersey Devils of the NHL and had a long career in the minors. This article originally misspelled Ken Linseman's family name. As Linesman. Which is the guy who works with a referee. Which would have been clever had it been intentional and not a typo. It has been changed. Linseman's nickname has also been added to the text. 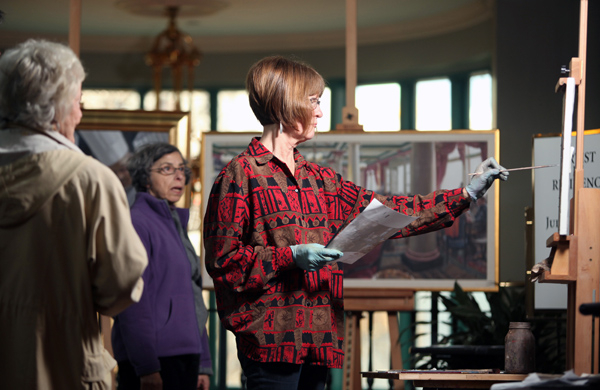 Judy McLaren has been artist in residence at the Fairmont Empress in Victoria since August. 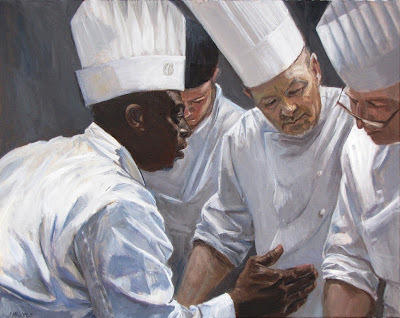 A glimpse in the kitchen led to this oil painting, titled "Pastry Chefs." Judy McLaren stepped back from the canvas, then tilted her head before reaching forward to make broad strokes with a brush. She wore paint-splattered gloves on both hands. A drop sheet protected the carpet. Painting can be a reclusive activity, typically practiced alone in a studio or garret. Not so for Ms. McLaren, who is creating art as a form of spectator sport. A stream of passersby flowed past. From time to time, people stopped to watch, commenting on the work. The artist has been on public display in the upper lobby of the Fairmont Empress Hotel since summertime. She is the current artist in residence at the stately hotel. For several days of the week, she can be found daubing and dabbing outside a temporary gallery housing her latest works. Her role is to be “an ambassador of art,” she told one recent visitor. If so, her attaché is Bubbles, an amiable seven-year-old goldendoodle with black fur who is her constant companion. Bubs, as she is also known, caused a minor diplomatic flap the other day when she helped herself to a chocolate treat attached to a gingerbread house on display in the lobby. The artist and her dog have been daily features of hotel life for six months now. Ms. McLaren wanders the halls in search of subjects, as she has made the hotel the focus of a series of 16 paintings completed so far during her residency. She has portrayed the hotel’s elegant tea room, which is a popular stop for tourists, as well as the Bengal Lounge, where an ancient tiger skin over the fireplace is a reminder of an empire’s former reach. A thin woman of bright temperament and an ease at making acquaintance of strangers, Ms. McLaren, 60, has taken on a heavy workload with ambitious goals. She knows it is a rare privilege for an outsider to explore the nooks and crannies behind the curtains of a busy hotel. “An artist doesn’t get chances like this all the time,” she said. Her current canvas includes the early outlines of a painting featuring the banquet staff having a meeting in an empty dining room. She was attracted by the light of the room, where an afternoon sun turned long-stemmed wine glasses into vertical streaks of silvery white. The artist has completed portraits of general manager Martin Leclerc and executive chef Kamal Silva. 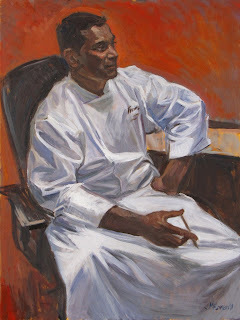 More remarkable is to see the working staff of the hotel portrayed in oils. Perhaps the most dynamic of her hotel works depicts a quartet of pastry chefs in an intense discussion. The artist has an affinity for the kitchen, where the industrial setting is offset by cooks in brilliant white coats and chefs topped by mushroom-shaped toques blanches. The artist was born in 1951 in Guernsey, the British crown dependency whose bailiwick includes several islands in the English Channel. Her birth came just six years after the Germans were expelled from the only British soil occupied during the Second World War. Her father was an Anglican priest whose parish included the isolated and bucolic isle of Sark. After postings in England, the family decided to immigrate to Ontario, her father taking a teaching position at Upper Canada College in Toronto. Ms. McLaren graduated from the Ontario College of Art and Design. She has been an illustrator for children’s books and does many commissioned oil portraits. Her husband is Keith McLaren, a senior master with BC Ferries who can be found aboard the Spirit of Vancouver Island as it plies the waters separating Swartz Bay and Tsawwassen. He won a prestigious award for a book on the schooner Bluenose, one of three books he has written. The artist has tailed porters, sous chefs and housekeepers. On Friday, she spotted Amanda Demontigny, a 16-year employee, at work cleaning the upper lobby. The worker scrubbed a staircase, her silhouette outlined by a grand window through which could be seen a spectacular, shimmering background orange leaves. “She’s going to be starring in one of my paintings,” the artist vowed. “That’s if you can catch me,” the cleaner replied, mopping feverishly, step by step. Passersby admire the work of painter Judy McLaren, who paints daily in the upper lobby of the Fairmont Empress Hotel in Victoria. Chad Hipolito photograph for the Globe and Mail. Andy Stephen in the studios of Victoria radio station CKDA, circa 1954. He later became a well-known reporter with television station CHEK. Andy Stephen reported the news of Vancouver Island to a television audience for whom he became as familiar as the newsmakers he covered. With a stentorian baritone, his words enunciated with crisp precision, Stephen chronicled the damming of rivers and the cutting of highways through British Columbia’s rugged terrain. He arrived in Victoria shortly after the ascension of W.A.C. Bennett to the premier’s office, an era in which Social Credit went from loony fringe to family dynasty. Stephen, who has died, aged 84, forged working friendships with the premier and his supporting cast in cabinet, plying them with drink (save for Bennett, a teetotaler) and invitations to go fishing. Every three years, the reporter seemed to scoop the rest of the pack by breaking the news of an election call. So predictable were his exclusives that jealous rivals wondered how the reporter became privy to inside information. Was he in cahoots with the premier? The truth, according to Jim Hume, the veteran political columnist, was far less dramatic. Stephen was a rare reporter to have established a relationship with Commander Gar Dixon, the tight-lipped secretary of Government House. When rumours swirled, Stephen made a daily morning telephone call to the residence of the lieutenant-governor. After chit-chat about fishing, the reporter would ask Dixon, “Is the premier dropping in for tea today?” An affirmative answer meant an election writ, or at least a cabinet shuffle, was in the works. For 22 years, Stephen hosted Capital Comment, a weekly roundtable program in which reporters and politicians discussed the issues of the day. Premier Bennett was the inaugural guest. Such exposure, as well as his pioneering work as a television reporter covering the legislature for stations based in Victoria and Vancouver, made Stephen a recognizable figure even to residents in such far-off locales as Pouce Coupe. Blessed with a rich, resonant tone, Stephen required no amplification. His voice boomed. Even when whispering, he did so in a voce less than sotto. It would come as little surprise to his audience to learn he had been briefly an opera singer as a youth before he ever considered becoming a newsman. 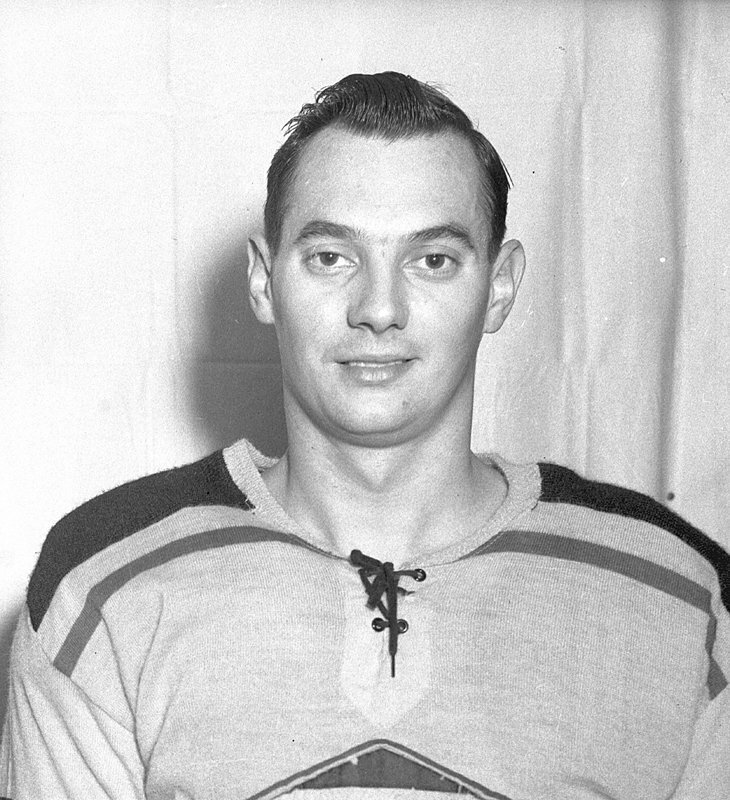 Born in Edmonton on Aug. 22, 1927, Andrew Yurechuk was the son of Ukrainian immigrants. His father, Stephen, arrived in Canada as a year-old infant in 1903, while his mother, Katherine Kolody, born in the town of Stryi, settled with her family in southern Alberta a decade later, homesteading near the hamlet of Etzikom. Andy Stephen and W.A.C. Bennett on Capital Comment. While visiting Toronto in 1948, Yurechuk popped into the CBC’s studios, where he met Leslie Nielsen, who advised him to enroll at the Academy of Radio Arts operated by Lorne Greene. He did so, soon dropping out, having been hired as an announcer at Ottawa radio station CFRA. By then, he had adopted his father’s given name as a surname. He broadcast ballroom dances at the Chateau Laurier and fiddler’s dances in towns along the Ottawa Valley. A highlight was covering Newfoundland’s entry into Confederation in 1949. In Ottawa, he worked with announcer and program director Fred Davis, later to become nationally famous as host of television’s Front Page Challenge. 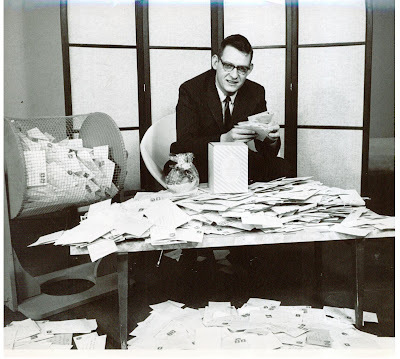 In 1953, Stephen was hired as news director of Victoria station CKDA and, three years later, also became the first news director after the launch of television station CHEK, the first privately-owned outlet in the province. At Channel 6 on the dial, it was only the third station available in southwestern British Columbia. 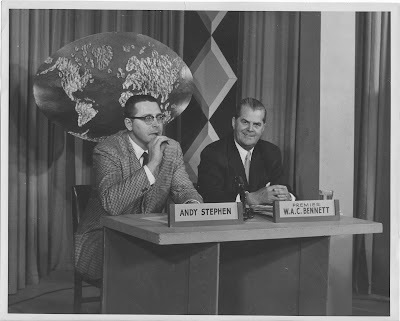 His days began before dawn as he prepared morning news casts for the radio station, then moving on to the television studio, where he anchored the suppertime 6 Star Final News. He later co-hosted a noon-hour show. Stephen covered the Swiftsure international yacht race from aboard the ocean-going tug Sudbury, delivering hourly reports over a grueling 32-hour broadcast session. In other summers, he provided dramatic accounts as marathon solo swimmers Marilyn Bell and Cliff Lumsdon each conquered the chill waters of Juan de Fuca Strait. A rare serious crime occurred on April 24, 1960, when an escaped mental patient shot 35-year-old Saanich police Const. Robert Kirby, a six-year veteran, through the heart, killing him instantly. Stephen covered the aftermath of the shooting scene, as well as the funeral procession, but his cameraman was barred from the church. It was in the province’s hothouse of politics that he earned his reputation. He caused a stir by making the first radio report of the sitting of the Legislature from within the chamber in 1953. His arrival in the building was not greeted warmly by print rivals, who vacillated between sneering at radio and television reportage while fearing that it might end their predominance, as it did. In time, colleagues in the Legislative Press Gallery warmed to him, and Stephen served three terms as president, presiding over the writing of the group’s first formal constitution in 1972. (He was succeeded by Barbara McLintock, who became the first woman to hold the post. She is now a coroner.) He was later made a life member, a rare honour. The Socreds delivered an activist government, nationalizing the hydroelectric company and creating a provincial ferry service. While such characters as highways minister Flyin’ Phil Gaglardi, who explained speeding tickets by insisting he was “testing the curves,” offered good stories, the government remained very much a one-man act. In 1959, the Queen of Sidney, a car ferry built at the Victoria Machinery Depot, was launched with fanfare as the first of a fleet of boats that would come to be known as Bennett’s Navy. The premier had a surprise for those who joined him on the ferry’s inaugural voyage. During the sitting of the legislature, the premier conducting a brief session daily in his office at precisely 9:30 a.m. Stephen sat at the end of the premier’s desk, while other reporters sat in two rows of chairs. The questioning ended when Stephen said, “Thank you, Mr. Premier.” Stephen was one reporter who could attend after hours at Bennett’s Oak Bay apartment without incurring the premier’s wrath. The hard-drinking denizens of the Press Gallery, who worked then as now in a cluttered, filthy space mirroring the setting of The Front Page, were keen for hijinks. Stephen led a team of fortified reporters to victory in the First Great International St. Patrick’s Pothole Golf Tournament held in the northern Vancouver Island logging town of Port McNeill in 1968. They returned to defend their title the following year on a road trip during which the local Socred MLA was to officiate at the opening of a highway bearing his name. After Liberal MLA Pat McGeer, a noted oenophile, criticized British Columbia vintners for producing an inferior product, which he described as “terrible,” “lousy,” and “garbage,” Stephen organized a blind wine-tasting in which three imported whites were pitted against three provincial whites. The politician’s grimace, as though he had swallowed vinegar, made the national news and caused consternation among Okanagan wineries. Stephen eventually became a freelancer. He held positions as an information officer and for a brief time drove taxi in the city. He also exhibited a gizmo known as the Seat Belt Convincer, which simulated the impact of a crash at 6 m.p.h. (9.7 km/h). He died on Nov. 22 at Saanich Peninsula Hospital, near Victoria. He leaves his partner, Joan Martins; a son; a daughter; and, a brother. His memorial service was attended by many former colleagues, known as CHEK-mates. The station he helped launch aired a brief news report that evening including still images of Stephen interviewing Santa Claus, pecking at a typewriter, and wearing a grass skirt while beating a bongo drum. Bob Mercer, a longtime figure on the Vancouver publishing scene, is known for his spectacular Christmas compilation CDs. Rafel Gerszak photograph for the Globe and Mail. ’Tis the season for Christmas tunes, which have only been in rotation for four weeks now (with at least two more weeks to go). Three of Billboard’s top 10 albums in Canada this week are holiday themed with Jackie Evancho’s Heavenly Christmas and Justin Bieber’s Under the Mistletoe trailing million-selling Christmas by Michael Bublé. The Burnaby-born crooner’s album also tops the jazz, seasonal and digital charts. This season, he stands atop the music world like Santa at the North Pole. For some, the high rotation of canned carols and merry Muzak is enough to bring on madness. Santa Baby being sung in a Betty Boop voice by Madonna or Britney Spears? Bah, humbug. For others, Christmas songs offer a nostalgic journey through happy memories of frolic, family, and friendship. Bob Mercer is one of those who digs Christmas tunes. A longtime figure on the Vancouver magazine scene, he is known for producing for his friends an annual compilation of rarities and oddities. He doesn’t roast chestnuts on an open fire, he burns them onto a CD. At this time of year, he always has CDs on hand. He considers the annual compilation to be his Christmas baking. Mr. Mercer teaches publishing at Simon Fraser University after a long career in newspapers and magazines. He has been editor of Vancouver and the Georgia Straight, as well as other publications. When not in the lecture hall, he fronts The Masses, a blues-based rock ’n’ roll band. As a lead singer and harmonica player, Mr. Mercer is heavily influenced by Keith Relf of the Yardbirds. 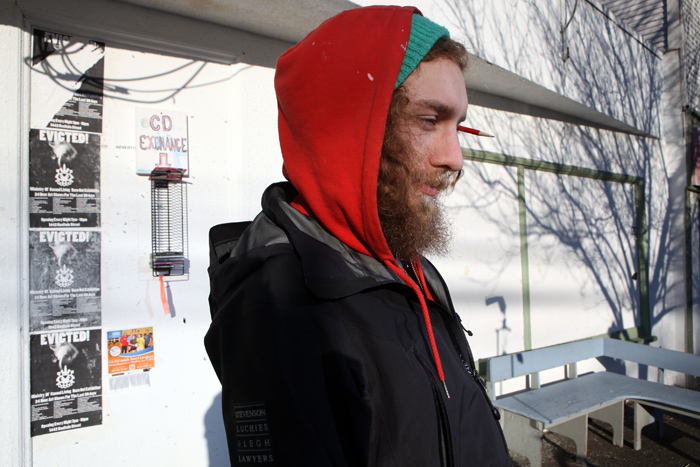 For years, he has haunted yard sales and thrift shops in search of discarded vinyl gems. Christmas records are both a popular seasonal purchase and a popular seasonal donation. He’d drop $1 on a K-tel collection, or a Time-Life box set. One of his favourite finds was a copy of Christmas Album by Boney M., the West German-based group featuring singers from the Caribbean. They had a monster hit in Britain with a cover of Harry Belafonte’s Mary’s Boy Child. He has found Christmas songs in just about every music genre imaginable, though the contributions from death metal bands is limited. The Vancouver punk scene’s pop chapter produced one killer yuletide song in the Payola$ Christmas is Coming. For years, Mr. Mercer made a master tape by dubbing from vinyl to a master cassette tape from which he then made tapes to hand out. He later moved to CDs and now can find even the most obscure tracks online. In his selections, he seeks a balance between the religious and those songs more attuned to the holiday’s pagan origins. When he was a boy, his family listened to records like Robert Shaw Chorale’s Christmas Hymns and Carols on the family record player. His father was a prominent United Church minister on the Prairies. Mr. Mercer was dragooned into a boy’s choir in Winnipeg. At church on the Sunday before Christmas, he’d hear the choir singing selections from Handel’s Messiah. “They’d tear the roof off the place,” he said. This year, his holiday playlist includes a rare cut called, How Will You Spend Christmas? by Rev. A.W. Nix. “You can’t hardly find a job no place,” the reverend says in a rollicking sermon recorded live with sing-song preaching and a call and response from the congregation. “Your wife is mad, your chillins crying, how will you spend your Christmas?” Not surprisingly, the reverend calls for a sobering up on Christmas Day, the better to praise God. On Tuesday night, Mr. Mercer was to perform in Vancouver with his band. They planned on ending their set with Run, Rudolph, Run, a hit for Chuck Berry. He hoped the rocking number might make someone’s Christmas. Victoria skaters enjoy a rare treat on southern Vancouver Island — a chance to skate outdoors on real ice. 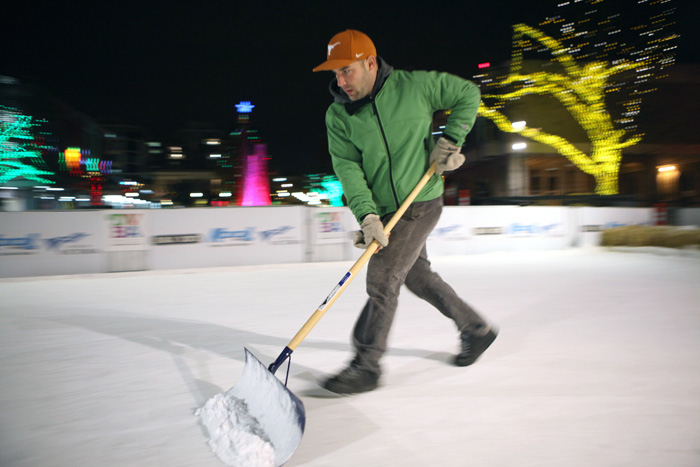 BELOW: A worker relies on old-fashioned methods to clean the rink. Chad Hipolito photographs for the Globe and Mail. The gear was carefully laid out — T-shirt, flannel shirt, long johns, socks, extra woolen socks, gloves, winter jacket, and hockey sweater. A thermos filled with hot chocolate was overruled in favour of a flask. Thus fortified, it was time for that greatest of our pastimes — skating outdoors in Canada in December. Toronto has 54 outdoor rinks, including the frozen reflecting pool at Nathan Philips Square, an ice surface large enough for games of shinny in the middle while recreational skaters complete loops on the edge. In Ottawa, temperatures frigid enough to rival those of Ulan Bator freeze waters solid for long winter months. The Rideau Canal Skateway stretches from the Parliament Buildings to Dows Lake, home to an outdoor art gallery. The 7.8-kilometre route offers warmup shacks with snacks and hot drinks along the way. Next month, the NHL’s all-star game festivities will include a nighttime skate along the canal by headlamp-wearing fans. Not to be outdone, Winnipeg grooms even longer trails along the Red and Assiniboine rivers, dotting the landscape with warming huts. This season, the huts along “the world’s longest skating rink” have been designed by such architectural luminaries as Frank Gehry. On southern Vancouver Island, the opportunities to indulge so simple a pleasure are few. It takes ingenuity, science, and a company from Ontario to create what nature neglects to provide. It is easier to find ice in cocktails at Clive’s Classic Lounge than at an outdoor rink. 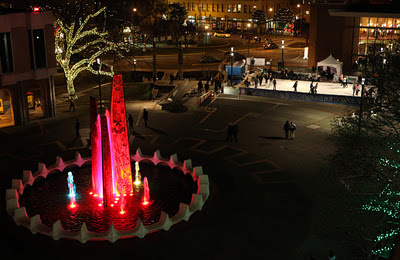 As the sponsoring Downtown Victoria Business Association promises: “Outdoor ice skating on REAL ICE!” It is a commodity so rare in the capital as to deserve capital letters and an exclamation point. Lacing on a pair of CCM Tacks 670 Pro 3 Lite hockey skates, I stepped onto freshly groomed ice, took five strides, turned left, two strides, turned left, five more strides, turned left, two strides, turned left. One circuit completed. The seasonal treat of a temporary outdoor skating rink at Centennial Square next to City Hall is tempered a bit by an ice sheet not much bigger than a goalie’s crease. Still, the sheet has attracted a steady crowd of skaters, including the likes of former Olympic figure skater Gary Beacom. On Friday afternoon, those at the rink admired Martin Newham and Andrea Boyes, who has appeared in such shows as Disney on Ice and Holiday on Ice, as they practiced a few moves. The skaters, with the Juan de Fuca skating club, won a silver medal in the adult nationals competition in April. Looking out on the scene was Emir Ishmael, 51, a visitor from Mississauga, Ont. He had flown in to check out on the ice his company, Center Ice Home Arenas, had constructed in the square. The weather was sunny, the temperature a warming 6-degrees C. A slight, cheerful man, he wore a toque on his head. He was not worried the above-freezing temperatures would turn his ice to slush. A giant refrigeration unit chills glycol in plastic pipes beneath the surface. The unit is strong enough to keep water frozen even when the outside temperature is as high as 17-degrees C.
“We don’t want to have the rink melting,” he said. The sheet is 36-by-56 feet (about 11-by-17 metres) with a claimed capacity of 60, which one suspects would look like a crowd scene in one of those penguin movies. Because the surface is so small, the resurfacing has to be done by hand, a scraper pushed along followed by a tool through which water pours onto the ice, made smooth by a trailing cloth. The hot water for the Victoria rink comes by a garden hose from the lobby bar at the nearby McPherson Playhouse. Mr. Ishmael spends his winters erecting similar rinks in the backyards of well-to-do families in Greater Toronto. Next year, he hopes the business association will go for a larger rink, perhaps one even circling the fountain in the centre of the square. He takes pride in his craft. “I try to make good ice so I can enjoy other people skating,” he said in a voice in which his native Trinidad can be heard. He came to Canada 19 years ago, taking over his brother-in-law’s business seven years after that. He makes good ice, an achievement for someone who does not know how to skate. “I tried it a couple of times,” he said with a shrug. The iceman cometh without blades. Like a teetotaler tending bar, he is more interested in the theory than the practice. 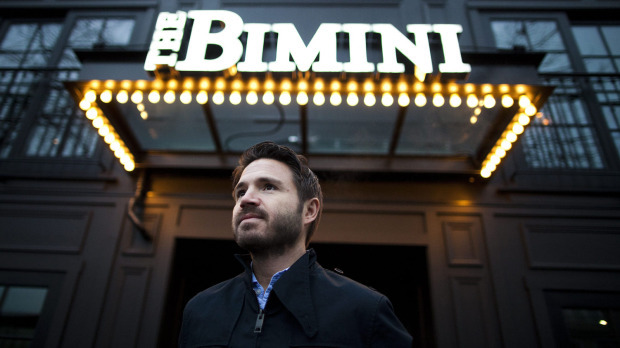 Jeff Donnelly, who owns The Bimini pub, stands in front of the reopened Kitsilano landmark. You can tell the story of the city from that one address. 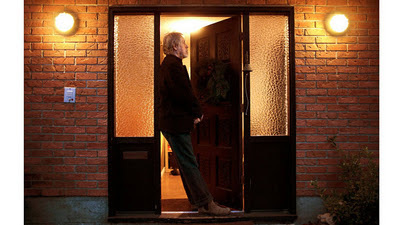 Rafel Gerszak photograph for the Globe and Mail. A landmark pub reopens its doors four years after being destroyed by fire. The pub enlists a publicist to ensure word gets out about “seasonal menus crafted from organic, locally sourced ingredients,” about an executive chef working with a consulting chef, about a design firm is enlisted to create a room with “a modern but warm and familiar feel.” It is noted the rebuilt interior includes 85-year-old wood reclaimed from a defunct mill. The bartenders at the Bimini in Vancouver’s Kitsilano neighbourhood are once again pouring pints, happy news for them and for those who imbibe. On Oct. 4, 2007, the day before the bar was to reopen following a $250,000 renovation, fire destroyed an historic building. Even a popular foosball table had been burned beyond salvage, the players melted into plastic blobs. Bars and restaurants open — and close — all the time in Vancouver. It’s part of the city’s boom-and-bust cycle. After all, a metropolis grew from a site beneath a maple tree chosen by a windbag saloonkeeper known as Gassy Jack Deighton. He promised to tap his whiskey barrel as soon as a wooden saloon was constructed. The work was done in a day. The Bimini, at 2010 W. Fourth Ave., became a landmark as one of the city’s first neighbourhood pubs. You can tell a chapter in the story of the city by working from that street address. For decades following prohibition, the hotel industry had a monopoly on the sale of draft beer. Nightspots were known as bottle clubs, where patrons bought pricy mixes to go with their secreted under-the-table, brownbagged booze. In Chinatown, thirsty patrons could order special teas in which beer would be served from pots into thimble-sized tea cups. The liberalization of liquor laws came slowly. A cocktail license is granted to the Dine in the Sky atop the Sylvia Hotel. Then, the Cave and Palomar clubs gain cabaret licenses. The longtime Social Credit government of W.A.C. Bennett, a teetotaler, is not eager to increase beer sales. The province’s drinking laws are considered antediluvian by sophisticates. The NDP swept away Mr. Bennett’s Socreds in 1972. They brought in Hansard for the legislature, banned pay toilets and corporal punishment in the schools. They also thought it might be pleasant for working people to celebrate the end of the day by enjoying a glass of beer at a nearby, English-style pub. Peter Uram, a recent graduate from Simon Fraser University who had been making commercial films, decided to try for one of the new licenses. He had bought a decrepit, wooden building on a stretch of West Fourth that remained more industrial than retail. The growing hippie popularity of the strip had seen the opening of small businesses such as the Soft Rock Cafe and the Lifestream health-food store. Mr. Uram’s building had long been the home of the Fourth Avenue Heating and Plumbing Works. It had a large open space and tall ceilings. At some time in the past, the space had been used for the building of sailing boats, which could be launched into the waters of nearby English Bay. To counter the monsoon-like autumn rains, the interior was given a tropical theme. He named the place Bimini after the paradisiacal Bahamian islands. The pub was a welcome addition to a street undergoing development. At the same time, the staff joined the Service, Office and Retail Workers’ Union of Canada, an independent trade union with a feminist perspective seeking to organize “pink collar” workers in bars, restaurants and banks. A bitter strike, including an attempted raid by an American-led rival union, ended with a contract. The union was decertified within a year. Mr. Uram remembers one unhappy night when the Doobie Brothers were made to queue. Another time, English punk rockers The Clash played foosball at the pub while being interviewed. In time, the street changed from semi-industrial to mom-and-pop retail to higher-end retail. Four years ago, he looked out his West End residence to see a tower of smoke rising from Kitsilano. He soon learned it was his building. The original wooden structure has been replaced with concrete block and sprinklers. “We’re good for another 50 years,” he vowed. The first building on the site had a tall ceiling and an open interior for a reason. At a time when West Fourth ended one block further west, when the few houses on the quiet slope were occupied by masons, painters and carpenters, a prominent local pastor named Rev. P.H. McEwen built the Fairview Baptist Church. The church abandoned the building after less than eight years. Demon rum is being offered where once the prayers were for temperance. The artist Aubrey Burke in front of the Ministry of Casual Living. The gallery, in which many Victoria artists made their public debut, is losing its storefront after a decade. Chad Hipolito photographs for the Globe and Mail. The sign on a whitewashed, one-story stucco building on a sleepy street looks, at first glance, like a government insignia. 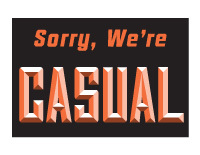 It has white letters on a brown background in the style used by the provincial government in the 1980s. On closer examination, the logo depicts not the provincial crest, but an abstract glyph. Some see in it what looks like an angry person. You could pass the buildings for days without noticing any activity. With its odd name and abandoned appearance, the storefront generates a vaguely Orwellian feel. It is located at 1442 Haultain St. in Victoria, at a quiet intersection in a residential neighbourhood where a handful of mom-and-pop businesses cover the corner — a barber, two groceries, a coffee shop, a video store, and a used- furniture shop. If you knock on the door, you might meet Aubrey Burke, a 24-year-old university student who is majoring in art and minoring in business. He is also a part-time janitor for the school board. 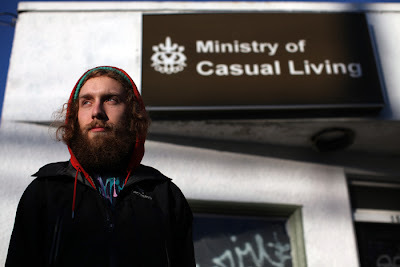 He introduces himself as the minister of casual living. For almost a decade, this address has been an art gallery for emerging artists, as well as a residence for whichever impoverished artist handles curatorial duties. The post comes with no salary, yet the reward comes in offering art to the world. You also get to use the nifty title of minister. A street-front window and a modest display space has been offered to artists since March, 2002. In every year since, the gallery has exhibited 50 weekly art shows. The ministry’s website notes the curators have no interest in credentials or curriculum vitae. Earlier this summer, the artist Pudy Tong had a display called “Brand New!” in which he created a letter banner like those used for birthdays, or anniversaries. This was made by exposing paper to sun through a stencil. Once hung in the window, the sun’s rays washed out the rest of the paper, erasing the message. The only limits placed on artists were to keep in mind the gallery’s neighbourhood setting, along which children regularly pass. Alas, the ministry is being evicted. The building’s owner is putting up for sale the ministry’s headquarters and the adjacent two-story building that houses a grocery. The asking price is expected to be a cool $950,000, beyond the means of artists who scrounge to cover $640 monthly rent. To bid farewell to the space, 30 artists have contributed 30 pieces for the final 30 days. It was called the Burnout Extravaganza. Though they are losing their Fernwood gallery, the second to close in the neighbourhood this month because of rising rents and development pressures, the ministry is continuing with art displays in downtown windows over the holidays. The founders deliberately chose a confusing name whose intent it was to encourage a vision of life away from the rat race. “It was made ambiguous so people would keep questioning, keep more of an open dialogue about what it could be,” Mr. Burke said. CUP RUNNETH OVER: The Grey Cup, emblematic of Canadian football supremacy, arrived at the Legislature on Friday, a rare visit to Vancouver Island for the silverware. The storied trophy was escorted by Geroy Simon and two teammates with the B.C. Lions, who won the championship in convincing fashion a week ago. Andrew Harris, who played junior football out of Nanaimo for the Vancouver Island Raiders and who earned most-valuable Canadian honours in the big game, was not with them. The players and the Grey Cup disappeared behind closed doors for a private autograph and photograph session with members of the B.C. Liberal caucus. Perhaps that was a reward for the government allocating $563 million of public funds to renovate the Lions’ home at BC Place Stadium. The Lions are owned by David Braley, whose company has donated to the Conservatives and who gained an appointment to the Senate last years. After the private session, the trophy emerged with a grinning premier in tow to be presented to the little people — guards, passing schoolchildren, giddy members of the press gallery. CHAMPS: Two Grey Cup champions once sat in the Legislature, though not at the same time. Herb Capozzi, who died last month, had two terms as a Social Credit MLA. Emery Barnes, a New Democrat, defeated Mr. Capozzi in the dual-member riding of Vancouver Centre in 1972. Mr. Barnes won re-election five times, serving for two years as Speaker of the House. Mr. Capozzi was general manager of the 1964 Grey Cup-winning B.C. Lions, for whom Mr. Barnes played defensive end. He missed the championship game with an injury. This article originally used an incorrect personal pronoun for the artist Pudy Tong. Inside, the writer Earl McRae told the story of Reggie Fleming, a Montreal guy who had gained a long hockey career despite limited skating and stickhandling skills. He occasionally put the puck in the net, but he was employed more for the damage his fists could do to an opponent’s face. Fleming was an intimidating presence, a ferocious fighter who rivals preferred to avoid. In hockey parlance, he was a policeman, a guy who maintained order through the threat of retaliatory violence should any of his more talented teammates be targeted. In the real world, he was a goon. The story knocked me out. You didn’t read this stuff on the sports pages, where the world is divided into heroes and goats. Here was an athlete in all his complications — a thug, ashamed before his children, but also a man earning a paycheque as best he knew how. For a Canadian teenager, this was Shakespearean drama (and in an English I could understand on first reading). The article, which became known as “Requiem for Reggie,” altered forever how I’d watch hockey, as a teenaged fan and, later, as a sportswriter. I loved the game for its speed, its majesty, and, yes, its violence — the spectacular and breathtaking way in which a bodycheck can change the complexion of a game. One Christmas, I got as a gift one of Don Cherry’s Rock ’Em, Sock ’Em Hockey videotapes. Liked the big hits. Cherry has produced at least 22 of those compilations. Now we know how grotesque my enjoyment has been. Not so long ago, athletes who “had their bell rung” were told to “shake it off” and get back in the game. Now we know a concussion can have long-term consequences, perhaps even devastating ones. Not so long ago, it was said no one got seriously hurt in hockey fights. Now we know that Reggie Fleming suffered brain damage. After he died, aged 73, two years ago, he was found to have had chronic traumatic enchephalopathy, a disease that alters behaviour and eventually leads to dementia. He paid a terrible price for those blows to the head, not the least of which was an early death. Junior hockey returned to Victoria earlier this year, when the puck dropped for the inaugural game of the Royals. The atmosphere was electric; O Canada was sung with an operatic flourish by Mark Donnelly; and, the hockey was thrilling, as the young players exhibited tremendous skill. In the first period, two players tussled at the blue line, dropping their gloves to throw punches. The crowd roared its approval, many leaping to their feet and punching the air. I stayed in my seat, as did some others. Cheer a teenager as he punches another in the face? Can’t do it. Those young men were barely older than I had been when a magazine article revealed to me the ugly side of pro hockey. Junior hockey permits fighting because the NHL permits fighting. Hockey would become even more savage without it, goes the argument. Besides, the braying crowds demand it. Yet, they hold an Olympic hockey tournament without fighting. World championships, too. All the major sports — football, basketball, baseball, soccer — punish fighting with automatic banishment from the game. As does college hockey. As did the NHL before 1922. The hockey world faces a crisis. Don Cherry used his bully pulpit on Hockey Night in Canada to dismiss as “pukes” the retired NHL pugilists who now question the role of goonery in hockey. Cherry apologized, sort of, weeks later, but the damage was done. He had estranged himself from some of the very players on whose bloody faces and sore knuckles he built a private fortune. It’s time to ban fighting in hockey. Now. Before any of these teenaged players whose exploits we cheer wind up with brains of mush, like poor Reggie Fleming. 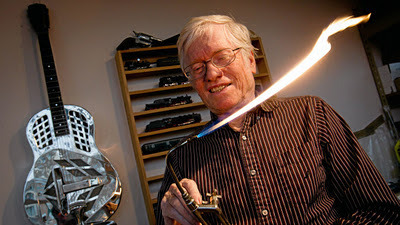 Hans Stamer fires up a jewelry tool in his Vancouver shop. His rock band wowed the critics, but he has returned to his roots in recent years by recording an album of jazz ballads. Darryl Dyck photograph for the Globe and Mail. Hans Stamer crafts by hand his own jewelry designs. He makes bracelets and brooches, engagement rings and wedding rings. “A lot of times when I finish a piece and it is handed to the lady who is getting married to the gentleman, I get a big hug,” he said. He also has on offer in his shop compact discs tucked inside jewel cases. For many years as a young man, he abandoned the jeweler’s workbench for the concert stage, put aside a craftsman’s tools to instead hold a microphone. This was one goldsmith who sought to make a gold record. Mr. Stamer (pronounced STAY-mer) began an apprenticeship at age 16 in his native land, taught by master goldsmiths in skills that trace their roots to the ancient Phoenicians. He was early into his training in Hamburg when he attended a concert by the great jazz trumpeter Louis Armstrong. Mr. Stamer caught many acts that toured through Hamburg, including a rocking group from Liverpool who appeared at clubs along the Reeperbahn. Not long after he moved to Canada, he was surprised to see the Beatles on the Ed Sullivan Show. He had been unaware of their startling rise in popularity. In Edmonton, he fronted a group called The Famous Last Words, a hard-driving blues outfit. In front of a microphone, Mr. Stamer lost his accent, transforming himself into a raspy-voiced, hand-clapping son of the Southern soil. He was “a boy from Hamburg who sounded like he was from the Mississippi Delta,” said Al Girard, the group’s drummer. 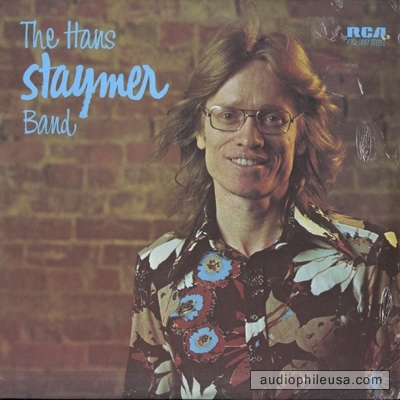 Mr. Stamer then wound up in Quebec as lead singer of the Backstreet Dudes, replacing Chan Romero, the author of Hippy Hippy Shake, who had abandoned the band after finding God one Christmas while at home in Montana. The Dudes renamed themselves Phoenix of Ayer’s Cliff, after an Eastern Townships village, and toured the United States. 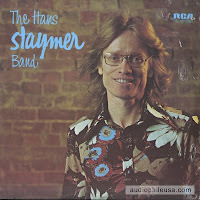 By the early 1970s, Mr. Stamer had formed his own eponymous band, changing the spelling of his name to Staymer at the urging of the record company. 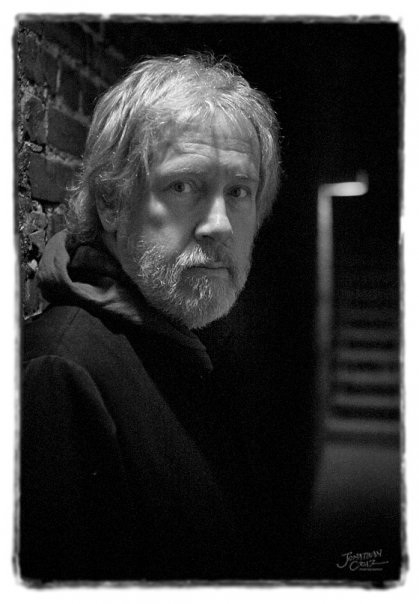 He also released a full long-playing record with an album cover featuring him rubbing a washboard. “The cuts virtually sizzle and sputter with a form of musical and vocal intensity that is indeed a delight,” the music-industry magazine Billboard stated in a review. The single Dig A Hole got scattered airplay across Canada and the U.S. The band signed with RCA Canada and opened for the likes of James Brown, Tina Turner, and Bachman-Turner Overdrive. A second album was praised for “a loose, easy-rolling funkiness” by Jim Millican, a reviewer for the Canadian Press. A full-page advertisement appeared in Rolling Stone. The band was preparing to go to San Francisco for a show, where they were to meet Ralph J. Gleason, the influential jazz and rock critic. The visit was cancelled when the critic died suddenly. “One of those breaks,” Mr. Stamer said. Soon after, the label lost interest. The singer returned to his old craft. He did not give up music entirely, performing around Vancouver with the R&B Allstars, a well-regarded outfit with as many as 10 players who were known for wearing formal white tuxes, “a real whoop-de-doo show,” Mr. Stamer said. He opened a shop, only to abandon street-level retail after being pepper-sprayed by a thief. In 1998, Mr. Stamer earned a Juno Award nomination with Bill Bourne and Andreas Schuld for best blues album for No Special Rider. The award went to Colin James, the younger Vancouver bluesman. There were no hard feelings. When Mr. James got married, it was Mr. Stamer who crafted the wedding rings. 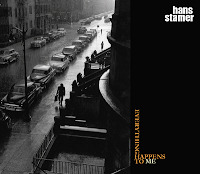 Two years ago, Mr. Stamer at last recorded the album he had in mind ever since seeing Louis Armstrong all those years ago. 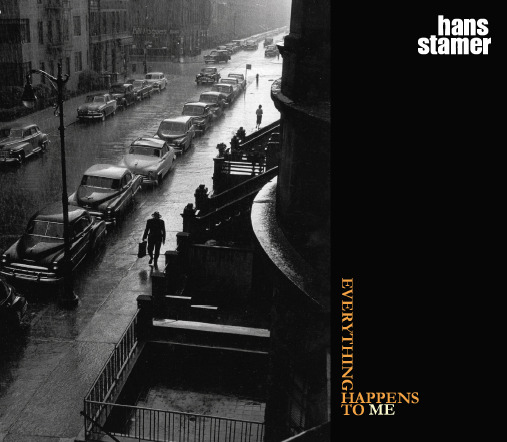 The title track of Everything Happens to Me shows the goldsmith’s voice has not tarnished over the years. This record is gold in everything but sales.